Carolyn and I just got back from Austin where we checked out the Paleofx conference, for the first time. Carolyn had been before but I also checked out Austin for the first time. I can’t say which was the bigger draw for me but we enjoyed both. While it’s fresh in my mind, and before the week takes over, I wanted to recap the conference highlights. We’ll do a separate Healthy Austin post too. There were a lot of semi-out there, though intriguing, tidbits at the talks we attended.For example, Ben Greenfield suggested micro dosing with LSD for creativity. We’re so far from judgy but we’re going to skip that one (at least until we vet it). Lion’s mane. I have been using lion’s mane, one of the mushrooms with health benefits, on the mornings that I write. It’s known to improve cognition. We saw it offered in coffee in Austin. I have been liking this one but Four Sigmatic makes a lion’s mane coffee that’s great too. Sleep- it’s now less about stressing the importance of sleep (we all know) and more about methods to maximize sleep. I broke down and bough the Oura ring, it monitors sleep and steps and heartrate. I love that you can put it in airplane mode/ pause the Bluetooth. Carolyn corrected me like 10 times when I called it the Nuva ring (omg), and Oura goes on your finger btw! Overfruiting– I got some pushback for calling out fruit in Little Book of Thin. Fruit is healthy but not the way many people eat it. JJ Virgin concurred. She discussed how readily fructose is stored in the liver as fat. It’s why we’re seeing fatty liver in kids now. Virgin also said, in the course of her talk, “I’m sure none of you have friends who eat pizza.” Carolyn and I looked at each other. Yes! JJ we do, actually we eat pizza, mostly cauliflour (use code Foodtrainersfave for discount) and Capellos but still. Balance– I wish I had a better word for this. Any ideas? Paul Chek talked about four areas: quiet, diet, movement and happiness. We need to give each of these attention. Time alone, attention to our diets, movement-whatever it is for you and activities that bring us joy. He also talked about his two wives and had a song for each of these topics. Enjoying time alone, singing and dancing were three things he mentioned many people stop doing at some point. The 6 percent-along similar lines, Robb Wolf said only 6% of Americans engage in the top 5 health behaviors. Robb also discussed genetic variability and nutrition. For example, some people can have more carbs than others, without gaining weight or body fat. Carolyn and I didn’t record those 5 behaviors but it’s interesting to think very few people manage to get all their wellness balls in the air. Jerky, collagen and lower sugar grain free sweets figured prominently in the expo. We had many glasses of vital proteins marine collagen water. For jerky, I love my Vt smoke but did not love a liver beef jerky (I tried knowing how nutrient dense organ meats were). We were happy to see and sample Soozys and have a cookie we’re hoping to bring your way soon…suspense. Exercise timing– timing has received a lot of attention with regard to food. We suggest a 12-hour rule at Foodtrainers (12 hours from first bite to your last). Exercise timing was brought up a bunch. Exercising before breakfast or on empty is something to try. Exercise is also neuroprotective, one of the best things you can do for your brain health. You need to get your heartrate up but the specific type doesn’t matter as much. Bloodwork– in our favorite talk of the weekend, David Pearlmutter (Grain Brain author) explained that markers of inflammation at mid-life can be predictive of dementia later. And something we stress at Foodtrainers, “normal” bloodwork doesn’t mean optimal. It’s not about not having diabetes…yet or rickets but what sets you up to be healthiest later. We have a list of tests we have clients ask for at their doctor’s offices. We also have them retain a copy of their results. Gut health– this is not a trend but something that really affects your whole body. Bad vegetable oils and sweeteners are harmful to your gut. While fermented foods, garlic and probiotic supplements are helpful. Our fave Farmhouse Culture were at the conference. This tonic and this supplement are bestsellers at our shop. 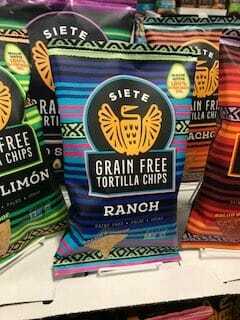 Ranch– I would be remiss if I didn’t tell you Siete chips are now all vegan AND that ranch is one of their new flavors. Ranch fans, you’ll get why this is amazing news. New info can sometimes make me feel pressured to get it all right. I don’t want you to feel that way. Pick one of these tips and look into or try to integrate it. OK? Let me know how it goes.